Let’s keep this short. You’ve almost certainly added ‘GDPR’ to your to-do list by now. You probably also know that, on 25th May, any organisation with EU subscribers on their mailing list needs to comply with the new General Data Protection Regulation. 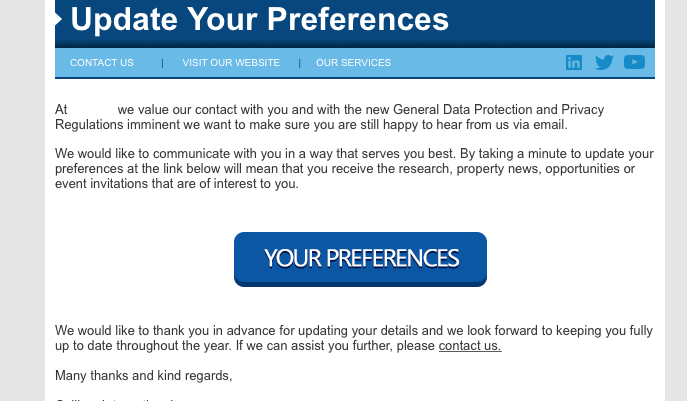 Unless your list is already GDPR compliant (ie you can prove that every contact actively chose to be on it) this involves sending out the Big Scary Consent Collection Email that invites existing contacts to opt in or out of future comms from you. Setting up that campaign is easy enough. Most email marketing platforms offer step-by-step compliance guides, like this one from Mailchimp, detailing all the things you need to include in your consent campaign. BUT: even if you follow one of these to the letter, you won’t be home and dry just yet. If the 2Forks inbox is anything to go by, it seems marketing managers who have mastered the consent form are so damn relieved to have got through the techy part of their campaign they forget that this could well be the most important email they send this year. And that, my friends, is a blunder you won’t want to make. The GDPR consent campaign is your chance to hammer home exactly why no-one can afford to miss your emails so remember to pitch your value to your consumers. As you’ve probably heard, inaction equals opt-out when it comes to GDPR consent. So, if you’ve not managed to get existing customers to opt in by the 25th of May, you’ll have to delete them from your marketing list. Ouch. A bit of fall-out is inevitable but, by giving your customers a compelling reason to opt in, you’ve at least tried your very best to keep them – and we’ve got a guide to help you do just that. 1. Have a long, hard think about the value your content adds to subscribers. 2. Write a killer opening paragraph that demonstrates how you serve up that value. 3. Continue selling value on the landing page. 4. Give customers a choice of opt-ins so they can decide what type of content they want to receive. 5. Draft at least two subject + preview line combos and test their effectiveness on a small part of your list before sending to all. Remember that most people browse emails on their phones so these two short lines of copy are what decide whether your email gets deleted before it’s even opened. 6. Don’t hit send and think ‘Great, I’m done’. You’re allowed to use your current list as usual until the GDPR deadline so keep sending variations of your consent campaign until you’re satisfied with the number of opt-ins you’ve received. We’re copywriters, not lawyers, so you can’t come to 2Forks for legal advice, but if you’d like help creating copy that keeps your mailing list looking healthy after 25th May, get in touch. For a definitive guide to GDPR, check out the Information Commisioner’s Office website.